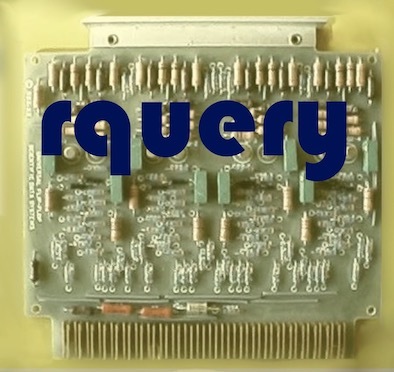 rquery is a piped query generator based on Codd's relational algebra (updated to reflect lessons learned from working with R, SQL, and dplyr at big data scale in production). Note: rquery is a "database first" design. This means choices are made that favor database implementation. These include: capturing the entire calculation prior to doing any work (and using recursive methods to inspect this object, which can limit the calculation depth to under 1000 steps at a time), preferring "tame column names" (which isn't a bad idea in R anyway as columns and variables are often seen as cousins), and not preserving row or column order (or supporting numeric column indexing). Also, rquery does have a fast in-memory implementation: rqdatatable (thanks to the data.table package), so one can in fact use rquery without a database. project(). Project is usually portrayed as the equivalent to column selection, though the original definition includes aggregation. In our opinion the original relational nature of the operator is best captured by moving SQL's "GROUP BY" aggregation functionality. select_rows(). This is Codd's relational row selection. Obviously select alone is an over-used and now ambiguous term (for example: it is already used as the "doit" verb in SQL and the column selector in dplyr). A great benefit of Codd's relational algebra is it gives one concepts to decompose complex data transformations into sequences of simpler transformations. SQL's realization of sequencing as nested function composition. A lot of the grace of the Codd theory can be recovered through the usual trick changing function composition notation from g(f(x)) to x . f() . g(). This experiment is asking (and not for the first time): "what if SQL were piped (expressed composition as a left to right flow, instead of a right to left nesting)?" 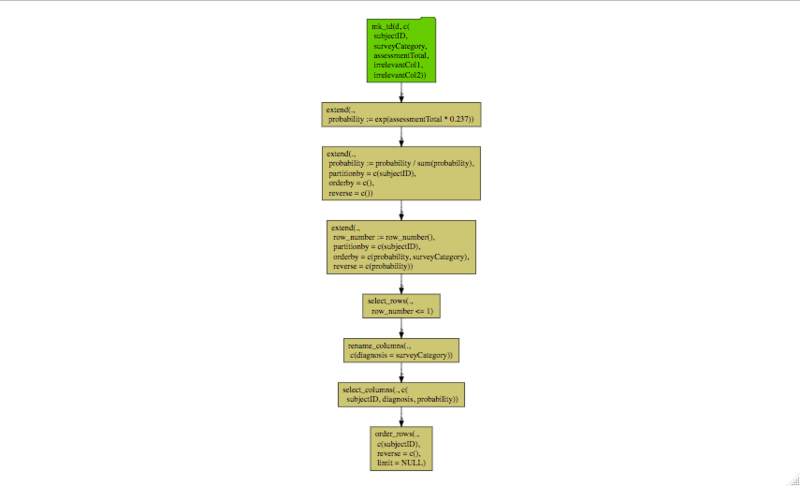 Let's work a non-trivial example: the dplyr pipeline from Let’s Have Some Sympathy For The Part-time R User. Note: in examples we use rq_copy_to() to create data. This is only for the purpose of having easy portable examples. With big data the data is usually already in the remote database or Spark system. The task is almost always to connect and work with this pre-existing remote data and the method to do this is db_td(), which builds a reference to a remote table given the table name. The suggested pattern for working with remote tables is to get inputs via db_td() and land remote results with materialze(). To work with local data one can copy data from memory to the database with rq_copy_to() and bring back results with execute() (though be aware operation on remote non-memory data is rquery's primary intent). ##  "table(\"rquery_mat_38954678098867775608_0000000000\"; subjectID, diagnosis, probability)"
We see we have quickly reproduced the original result using the new database operators. This means such a calculation could easily be performed at a "big data" scale (using a database or Spark; in this case we would not take the results back, but instead use CREATE TABLE tname AS to build a remote materialized view of the results).
) tsql_97627007110742070403_0000000006 ORDER BY "subjectID"
A feature to notice is: the query was automatically restricted to just columns actually needed from the source table to complete the calculation. This has the possibility of decreasing data volume and greatly speeding up query performance. Our initial experiments show rquery narrowed queries to be twice as fast as un-narrowed dplyr on a synthetic problem simulating large disk-based queries. We think if we connected directly to Spark's relational operators (avoiding the SQL layer) we may be able to achieve even faster performance. Don't override names() (messes up str()). Test checks that are correct when rqdatatable is attached. More per-DB SQL rendering control. Move to tree-based parse representation (instead of flat). Specialize materialze_node for lineage breaking. Na row interfaces (un-publish tokenize_for_SQL()). Add mutable scratch area on nodes. reflexive arguments to non-sql nodes. declare : as an inline operator. check for table name consistency. Force order limit to be >= 0.
add bquote() abstraction to extend_nse(), project_nse(), and select_rows_nse(). Allow a bit more flexibility on ordering in extend. Start breaking up some recursive calls. Export a default database description. Check more on project and extend interfaces. try to clean up immediate mode hooks a bit. Substitute in values in presentation layer (rqdatatable depends on this). Get rid of %>>% and old dbi fn-names. Try to improve use of regexps. Rename dbi_ prefixes to rq_ (for now have aliases from old to new). Get rid of embedded data cases and print-execution. Move to new wrapr ops. Rationalize names of table description methods. Don't default to setting up a temporary RSQLite database. Add ability to use %:=% in parsing. Separate execute() and materialize() roles. Fix natural_join() semantics and make "by" a required argument. Better detection of column types: dbi_coltypes(). Improve execute() performance in simple case. Add assign_slice(), if_else_op(), map_column_values(), and set_indicator(). Bug fixes (esp on data.frame path). Work around RPostgreSQL issue (dbTableExists does not work). More controls on dbi_ steps through package options. Push LIMIT deeper into pipelines. Better quantile calc (assume window functions). Work with more DB drivers. SQL node for sets of columns. Default sql_node to copying incoming columns. Be compatible with both wrapr 1.1.1 and 1.2.0. Minor format change in rename (anticipate wrapr 1.2.0). Get ready for S3 wrapr_applicable and pipe_step (un-block wrapr 1.2.0 release). Prepare for wrapr 1.1.0 features. More flexibility on assignment notation.